During the summer my preschool storytimes become family storytimes, including not just the 3-5 year olds, but also the 6 & 7 year olds. I do this by incorporating lots of STEAM elements and multiple activity stations so there is something for most, if not all. Here’s what I did this week during the first EXPLORE Family Storytime of the Summer. 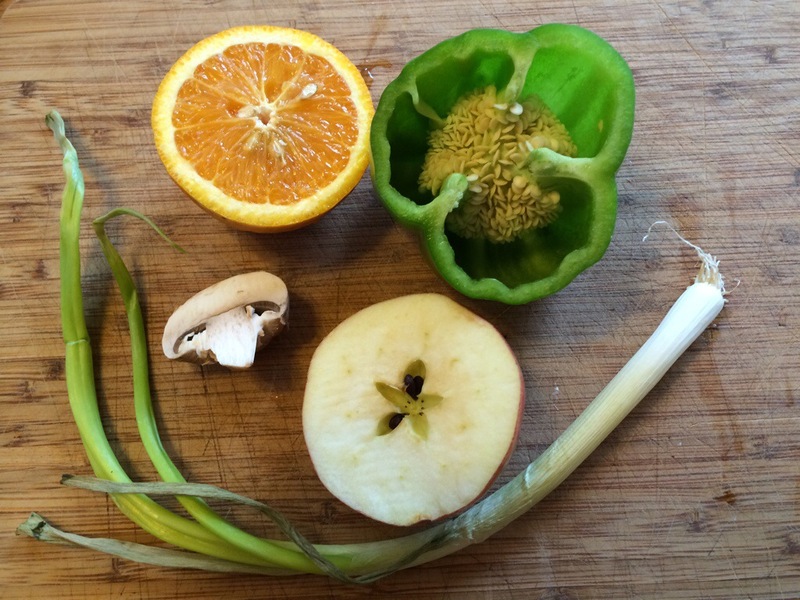 This week we explored the senses of taste and smell. To get the ball rolling, we talked about all of the senses and what we use them for. To do that, I brought along a beautiful book which helped us talk about parts of our body and what we use for each sense. We “bookwalked” our way through Jan Brocket’s latest title in her Clever Concept series. 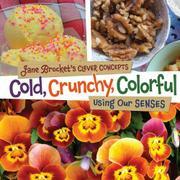 The books in this series introduce concepts exemplified by real-life objects or activities well-known to many preschoolers. This title demonstrates how we use five senses to interpret the world around us and is a good starting point for talking about how friends might compensate for hearing impairment or blindness. The book uses clear, eye-catching photographs and simple text to encourage kids to observe the world around them. 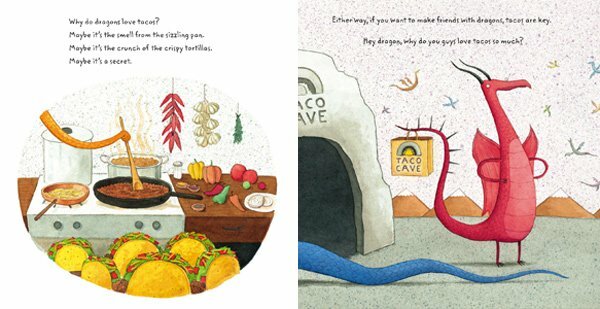 Adam Rubin and Daniel Salmieri teamed up to offer kids a silly story about dragons and their love for tacos, but not tacos with spicy salsa. This book is a crowd pleaser, even for those who have read it before, not because it is a mesmerizing story, but most likely because of its ridiculous premise (dragons eat tacos? No way! ), the presence of the beloved dragons, and the whimsical illustrations. We had fun exploring this book as a group, even discussing the senses of taste and smell in regards to tacos and dragons, and kids had lots to say. I sang the first verse of this old favorite using the color purple and then had kids call out colors for additional verses. By the third verse everyone was making stew. 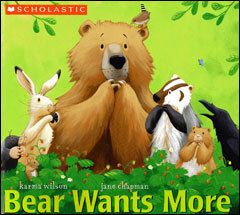 We have quite a few fans of Karma Wilson and Jane Chapman’s rhyming bear books! The lovable critters are fantastical, especially to Alaskan kids, but offer opportunities to talk about hunger, taste, hibernation, and of course what bears eat (and don’t eat in this book). While many of these animals would not be found together as friends in the wild, the large format graphics envelope the reader, drawing us into the sweet world of unlikely companions, even if just for a few minutes. We pretended to make and be popcorn during this song. It repeats so the first time I demonstrated the actions and the second time, kids (and adults) joined in. Here are the actions: pretend to pour oiling the pan, move imaginary pan back and forth over stove, pretend to pour in popcorn, use fingers to outline grin and smile, squat on floor and shake hands at sides, move slowly up to standing as Kim sings the word “sizzle,” dance to pop by pushing hands into air, then out to sides, and turn in circles, jump, or free dance. I played this song on my iPhone with portable speakers. After making imaginary popcorn, it was time to make real popcorn! I brought my friend’s air popper to show kids how it worked and to talk about what happens to turn kernels of corn into popcorn. Want to know more about popcorn science? Visit the popcorn website! (It’s all about the water.) Just plugging in the popper was interesting, but once the corn started to pop kids actually started to jump! I popped enough for each child to have a small cup at the tasting station (see below). I got the idea for this station off of Science Friday. (I try to listen to the show as much as possible for general interest sake and for good program ideas.) During the Scientists Test What the Nose Knows (3/21/14) episode, Andreas Keller tested Ira Flatow’s sense of smell by asking to him to smell three different samples and to then identify which two are the same. While Ira was given samples with multiple elements, I gave kids simpler smells. I left the experiment the same otherwise. I put several drops of an extract on a cotton ball and placed it in a dixie cup. It was obvious which cup held which scent, but I marked the cup underneath just to be sure. Each child had three cups in front of them. Two of them were the same and one was different. The child smelled each of the three and then selected the two that smelled the same. We had multiple scents so a child could test their sense of smell multiple times if they wanted to. I took the large bowl of popcorn we popped over tot he tasting station where kids could season it with salt, nutritional yeast, or cinnamon/sugar. The original idea was to have the kids take the popcorn home and eat outside the library, but that didn’t really work out. I ended up doing a little vacuuming afterwards. I thought I would need a fourth station so I added this one, but it was not very popular and I would exclude it next time. The idea is to have kids use their sense of taste (minus sight and smell) to determine if the white food in front of them is apple or potato. To do this, kids take a bite sized piece of apple/potato and eat it while plugging their nose and closing their eyes. It is designed to show kids how much we rely on multiple senses to taste the food we eat. As always, I included an art station. 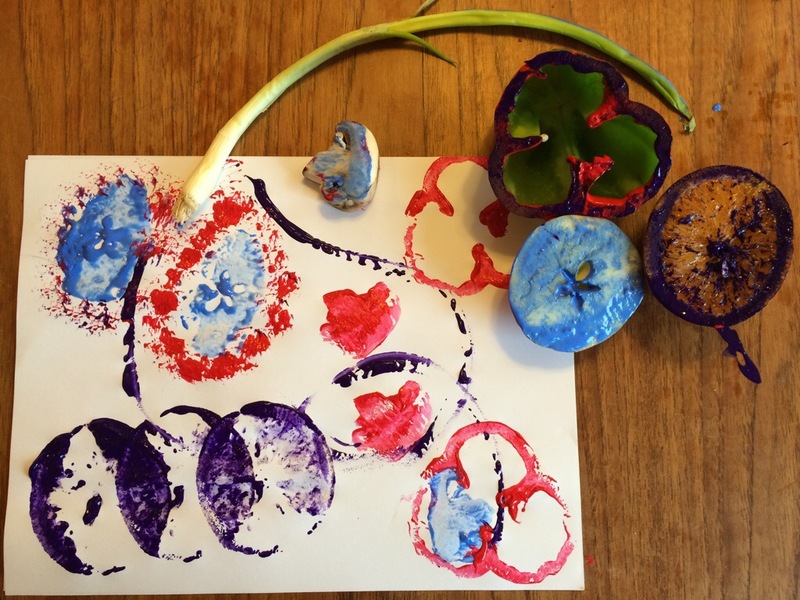 I’ve stamped with food at home with my kids and as a volunteer in classrooms. 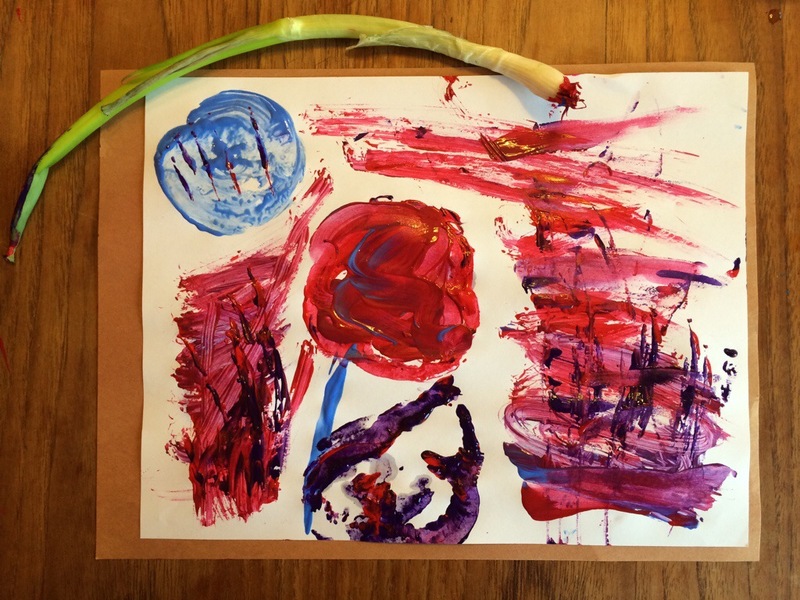 It was time to paint with fruits and veggies at the library. It’s obviously not a new idea and lots of examples can be found online. For more ideas for a food storytime and food stamping visit Sturdy for Common Things. 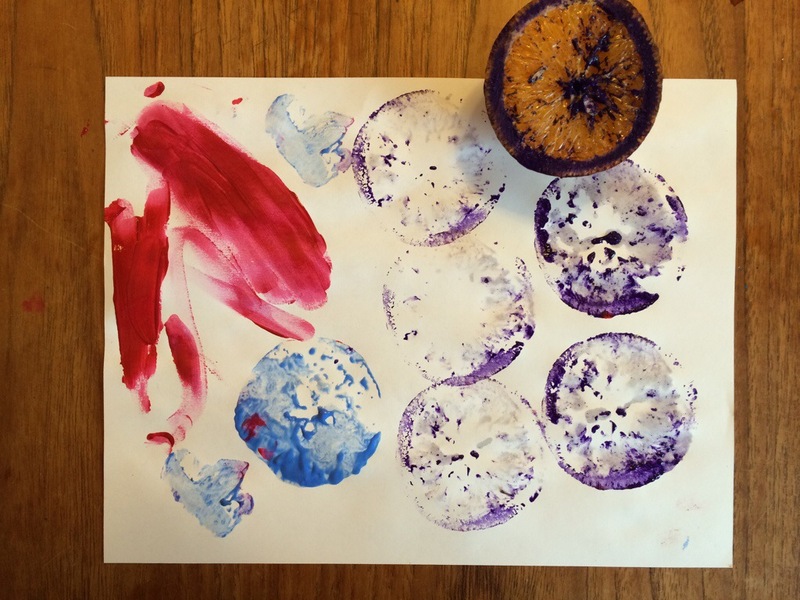 At the stamping station, kids found cut fruits and veggies, paint, and paper. I showed them what I created, but they needed no encouragement and quickly got started testing out the different painting tools. Many kids also used their fingers to add more depth to their paintings.